Lürzer’s Archive, recognized globally as the “creative bible” is producing it’s 9th edition of 200 Best Ad Photographers which has become one of the most prestigious competitions for ad photographers. Being featured in this special series is a unique opportunity to be seen by TOP creatives worldwide! Judged by an international team of highly esteemed art directors and publishing professionals, selected work will be featured in 400+ pages of 200 Best Ad Photographers, in print and digital editions. 20,000 copies will be distributed to over 70 countries worldwide! • Only published advertising and editorial work done within the last 18 months is accepted. This can also include self-promotion. • Selected photographers will receive 2 complementary copies and as many copies needed at cost. • A comprehensive index will carry contact information of the photographers represented. • Selected photographers new to Archive will have the opportunity to set up an online Profile with unlimited images. • Production costs are €1300 for a page, and €2400 for a spread. • NO SUBMISSION FEES! Enter as many images as you wish! 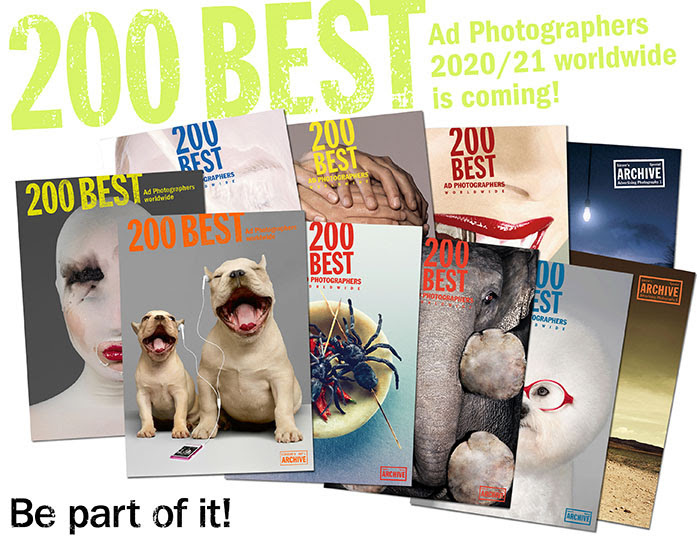 and choose 200 Best Ad Photographers worldwide 20/21. Do not miss a single deadline.